The lucky-image-integration software AutoStakkert!2 has been around since early 2012, and considering I'm pretty close to a very much workable 64-bit version of AutoStakkert! with some cool new possibilities, I decided to up the big number and go for AutoStakkert!3, to be released 'pretty soon'. I have essentially stopped working on the 32-bit release altogether, and will focus fully on 64-bit (I will also slowly try to get away from a single platform program - but this will be a slow process with low priority*). Don't worry; you shouldn't get lost in the interface - because nothing has really changed - and for most use-cases you'll probably not notice any significant differences. Behind the scenes, however, things have changed quite a bit. 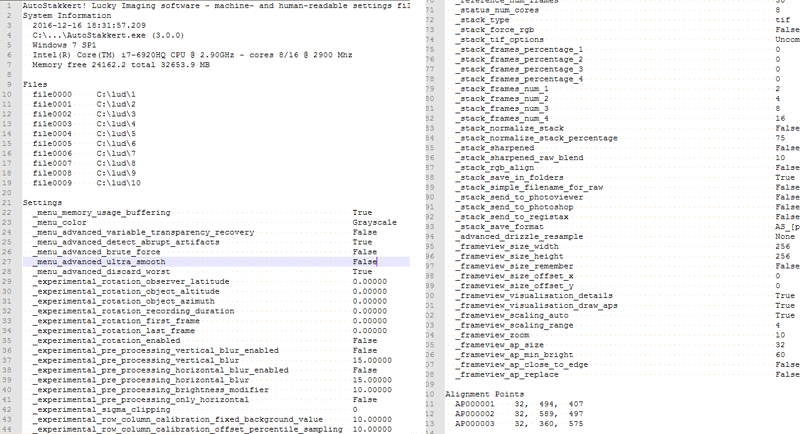 A 64-bit version opens up a lot of possibilities especially when working on large data sets. Working with GBs of 25 megapixel lunar data? Effectively using 30.000 alignment points at different scales? Not a problem! AS!3 is not so much faster during aligning or stacking (it will be if the recording can not be buffered in the the 32-bit version), but if your computer has enough RAM to work with, it should now be considerably more difficult to crash the software**. Furthermore, there is a new quality estimator implemented (that will very likely be the new 'default' setting) which generally works better in the more difficult image areas (e.g. edges of planets or solar discs). It may not always give better results, but I have found it does indeed do a better job on most of the recordings I tried it on (Mars, Venus, Jupiter and Solar data). The same quality 'scale' setting can be used to tweak the estimator and make it less tune in on noise, and from what I can tell, it should use very similar values. There is some stuff I want to do before the actual 'first' release of AS!3. I have about 100 'open' issues, most I can/will ignore, but some are interesting enough that I want to have a look. I expect the version to be available in the next two months or so; so you'll have to be patient. If you ask nicely though, I will be looking for some beta-testers soon. So if you like to test your - preferably large - recordings and at the same time help me out, please let me know. * Also, every time a Mac user pops up and complains about there not being any Mac lucky-imaging software available, I will delay my efforts by at least two months (and one month extra for every 'please'). p.s. AS!3 will remain free to use for non-commercial purposes. and it takes ages to process the individual panes. With such a low 8GB Ram though I am not sure if it would help me particularly or not. The new quality estimator sounds very interesting. Any way you are to be congratulated for doing so much for Lunar and planetary imagers worldwide. And making it available to us all. Edited by ivan11223, 14 December 2016 - 11:11 AM. Can we please have AutoStakkert 3 for Linux? Only kidding of course! I'm not even a Linux user aside from using Raspbian on my Raspberry Pi. However, I feel the need to point out to those that aren't aware of Wine can use it to run many Windows programs on Linux and macOS. I've tried AS!2 32-bit with it in the past and it works great! Whatever the case, I look forward to AS!3! AS! has quickly become my preferred align & stacking one-stop-shop for my processing. I'd buy it! It's that good. Marvellous. Thanks a lot your all this beautifull work ! Great! Thanks a lot for ur hard work. Edited by astromomo, 14 December 2016 - 04:29 PM. Another thing I'm working on for this release is the implementation of a setting/status/log file that is human and machine readable and can be used for debugging purposes when things go wrong (easy for me and you to replicate errors) as well as for storing and restoring 'sessions'. This should make it much easier to keep track of what exactly you did when processing, and/or continue working on your recordings at a later stage without having to manually remember the settings you used exactly. It will keep track of pretty much everything to restore AS! to an earlier state (and will also store some potentially interesting system information mainly about your CPU and memory. No personal information is saved). This sounds easy by the way, but it turns out to be quite tricky (and very tedious). Once it is implemented, it will allow you to have some nice possibilities though. I'm thinking about storing some templates for example (planet, camera, scope specific processing settings - that you could actually share with other people as well). Maybe there are some other use-cases for this too. For now I'm thinking about this settings file being stored at least for each processing run (with a time stamp in the filename for example). If you have more ideas about this, let me know. Edited by MvZ, 16 December 2016 - 12:55 PM. Emil, thank you for creating and continuing to improve this essential program. AS! has played a major role in the advancement of amateur planetary image quality. Can't wait for AS3! Yay I can do large files with my new 16f7 Thanks Emil . I didn't read the whole post I am busy researching my massive build project. I just wanted to look at something here real quick. 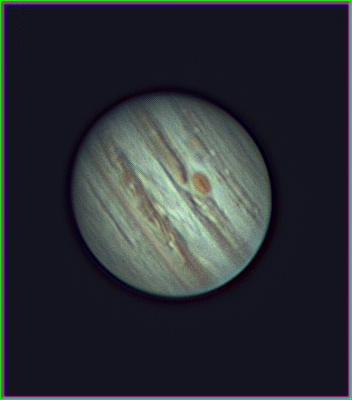 Any chance of having those neat wavelet sliders like in registax ? From what I understand theirs a limit to the size file you can open in registax. To better explain because I am not sure if I am using the right terminology. I heard that if you use the new celestron nex 10 at full image size the file wont open in wavelets in registax ? Edited by moonwatching ferret, 19 December 2016 - 08:51 PM. Fantastic news. My planetary imaging got so much better when I started using AS!2. Cannot wait for the update. Thanks so much for creating such an awesome piece of software for us all to use. Emil, thanks for your continued work on this project. I note, however, that at the beginning of November you uploaded the first beta of the 64-bit version of Autostakkert! (v2.7.7). I didn't know that you had done that until just today and as far as I can tell there was no post or announcement by anyone here on CN that the 64-bit version was even available. I'm just about ready to install v2.7.7 and I'll give it a try with some of my 16M pixel stacks of the moon. I'm not sure if there was an announcement about that; in this case I think mostly because it was the very first 64-bit version and I didn't want to be swamped by questions and requests and bug reports. I prefer to wait a bit with an official announcement until I know a bit more about how the software behaves in the wild. In this particular case I made a pre-announcement to force myself to work on it. Don't expect me to do advertising for the software. It is free software, and although of course I like when people use it, I'm not trying to sell anything. If I have something new, I'll post it on my ugly looking and difficult to find beta-testing page. If I have a first beta version of 3 ready, I'll post it here too. If I have a version 3 ready that I think is good enough (read: I get only a few bug reports), I'll post it on my main site as well. Wow, you should be super, super, super proud! Thanks so much for all your work on autostakkert. Looking forward to the new version. This is a 64-bit version of AutoStakkert!, and it can pretty much make use of all the memory you have in your system (so it actually makes sense to go for 32GB+ if you can, I find that the 16GB in my current system is often holding me back on processing. Still though, I think I might want to tweak the memory usage of AutoStakkert!3. If you have processing problems and you run out of memory, try disabling buffering (and let me know so I can try to have a look sometime). - for each stack a 'session' file is created; this is essentially just a text file containing all settings used to create this particular stack. You can open this session file in AS!3 and recreate the stack - with maybe some minor changes in AP placement- and continue or improve your processing. Well Emil you were good to your word! I'm looking forward to downloading the beta version and giving it a run. Thanks again for all your hard work! Awesome work, Emil. I'm already liking the results (running on an HP zBook G3 with 32G RAM). Can you tell me what you think the MINIMUM amount of RAM that would be usable with AS!3 ??? Can having a SSD cache help (I'm a chemist, not an IT!) ??? Thinking I might need a new computer ... also thinking I don't have the cash for a work station !!! If you delete the LastSession.as3 file, does it then work next time you run it? If not, if you delete the AutoStakkert.ini file, does it then work next run? If the cause was in lastsession.as3 or autostakkert.ini, could you send me that file by email so I can have a look? Edited by MvZ, 24 March 2017 - 03:02 PM.